Today was a should have day. A would have day. When I drifted off to sleep last night there were two sets of plans in my head. My mind turned them each over and over reviewing and revising what needed to occur for both Plan A and Plan B until the possibilities for both had been exhausted. I’m like that. I like to have a plan. It gives me a road map for my day. Isn’t it funny though that I can’t really read a map to save my life? Anyway, the should have. The would have. It should have been a snow day. In Portland the lightest dusting of snow tends to shut down the entire city. You’d think we’d never seen the fluffy frozen wet stuff in our life the way the news channels and the social networks get all a buzz with talk of snowpocalypse and snowmageddon. The city shuts down. The buses and trains get fucked up. School is cancelled. So when my alarm went off this morning and I learned that school had, in fact, not been cancelled or even delayed, that the city was proceeding as normal (Keep Portland Weird! It’s as normal as we get), and that the buses were running on normal routes I scratched my head. I crawled out of bed and made breakfast and lunch while glancing out the window at the clear brightening sky. And that, my gentle readers, is when the snow began to fall. I felt grownup and slightly mid-western as I walked my kid to school in the gently falling snow. My Favorite Things played over and over in my head and as I started back home I was quietly singing along when a snowflake landed on my lashes. And I smiled. 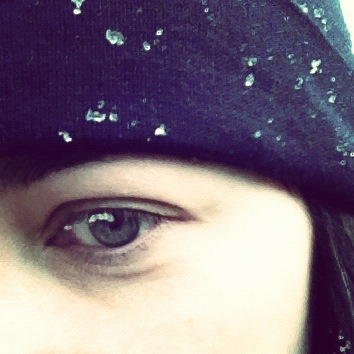 Nothing was sticking on the ground but there on my lashes a snowflake stayed. Snow should have meant Plan B. It should have thrown my day into utter chaos, instead, the snow rested gently on my lashes and clung to my hat and coat while slush sloughed around my boots and I went about Plan A… just a little more slowly. I had the day I should have had, not the day I would have. And it was happy. And, you know, stuff. That is a special day indeed. Well I am impressed. I need plans too, but I get annoyed at myself for being so easily thrown when my plan skips a beat.